4 Beds 3 Baths 1 Partial Bath 2,506 Sq. 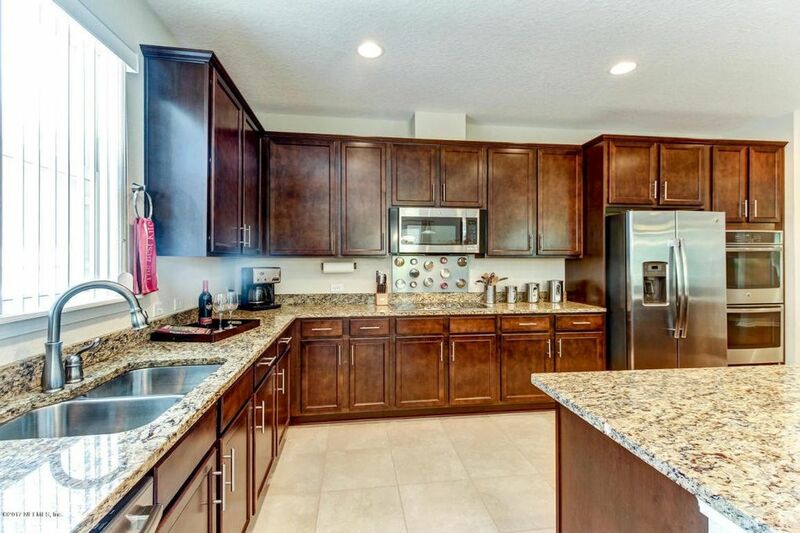 ft.
BEAUTIFUL BETTER THAN NEW WITH GOURMET KITCHEN! 4 Bed 2 1/2 Bath Home on preserve lot in desirable St. Johns County. Open & spacious floor plan featuring hardwood floors, 9' ceilings & upgraded 8' doors throughout. Chef's delight Kitchen with 42" endless raised panel cabinetry, granite countertops, gorgeous center island with ample storage, Breakfast Bar, large walk-in pantry & stainless steel appliances. Master Suite has generous walk-in closet, beautiful Master Bath with double sinks, granite counter tops, soaking tub & glass enclosed shower. 2 Guest Bedrooms share a Jack & Jill Bath. 4th Bed/Study has french door entry. Home has an indoor Laundry and convenient 1/2 Bath. 3 car tandem Garage. Community offers recreational pool, No CDD Fees, & A-Rated schools.